In the 46th issue of the Bed and Breakfast Traveller, we take you to Port Perry and the Scugog Township in Ontario. Located on the shores of Lake Scugog, due north of Oshawa, just an hour's drive north east of the City of Toronto, Scugog Township has quickly become one of the Durham Region's most popular and exciting communities to visit. the simplest of pleasures will draw you to Scugog, where you'll discover there is much more. Port Perry is the hub of Scugog Township. Within the Township you'll find friendly people, spectacular scenery, picturesque villages and unique shopping experiences. In Port Perry explore a variety of shops and cafes as you stroll amongst some of the most attractive Victorian buildings in the region. There is something for everyone to see and enjoy. In the summer, Lake Scugog is a magnet for families and folks of all ages. 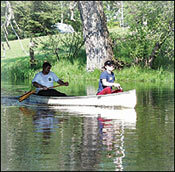 Enjoy the great outdoors with water-skiing, boating and fishing. Take advantage of the excellent boat launching facilities. Local marinas rent canoes and boats for fishing and pleasure cruises. Take a cruise on Lake Scugog in the "Woodman", Scugog Island Cruises, that offers daily tours from the end of Queen Street in Port Perry. The School House - Built in 1880 serves as the museum's main building, housing archives, offices and several displays. These include a Post Office, General Store, Hardware Store and Apothecary shop. Head Church - The Episcopalian Methodist Church was built in 1860 to serve the head of the Island and sits today on the museum grounds. The Print Shop - Contains an early Gordon hand-fed Press from the Port Perry Star, old wooden and metal type, early Ontario Wood furnishing and a variety of printed items. The Log Cabin - A one-room cabin built circa 1845 with a woodstove, kitchen furnishings, an operating loom and early twig furniture. An upstairs bedroom contains early bedroom furniture and quilts. This building, located at the corner of Queen and Simcoe St, Port Perry was recognized and approved by the Historic Sites and Monument Board of Canada as a historic building on May 11th 1996, when it was commemorated with an official plaque. Town Hall 1873, as it is known today, is used by many local arts and music groups, which include the Scugog Choral Society and Borelians Theatre Group. It is also available for rent to the public for community functions. "Yours to discover" in Scugog Township. Lake Scugog on the Trent Severn Waterway. Waterfront Parks, picnicking, swimming and walking. Cruise Lake Scugog on the "Woodman" Scugog Island Cruises. Nonquon Wildlife Preserve. Hiking, Canoeing and birding. 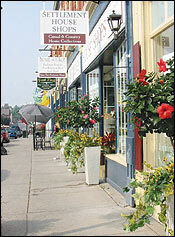 Shop historic downtown Port Perry. Unique specialty shops. Farm fresh markets. Baked goods and pick your own produce. Great Blue Heron Charity Casino. Northwood Buffalo and Exotic Animal Ranch-Seagrave. Scugog Shores Museum Village. Pioneer and First Nations. Port Perry historic Town Hall. Music and Theatre. Street Fest, Highlands of Durham Games, Renaissance Faire, Pow Wow, Artisan Studio Tour, Port Perry and Blackstock Fairs, Farmer's Market, Canoe the Nonquon, Open air ice skating. Cross country skiing, snowmobiling, parasailing and snowshoeing, skating, ice fishing, motorcycle ice racing, boating, watersports, camping, hiking and fishing. June 19th and 20th: Renaissance Faire: Seven Mile Island juried Art and Craft Show. July 1st: Canada Day Celebrations: Palmer Park, Port Perry. July 9th and 10th: Downtown Port Perry Street Fest: Palmer Park and Downtown Port Perry. July 17th and 18th: Mississaugas of Scugog Island First Nation 8th Annual Traditional Pow Wow: Scugog Island. July 23rd and 25th: Highlands of Durham Games: Port Perry and Uxbridge. August 20th and 21st: Blackstock Fair. Stop in at the Scugog Tourist Information Centre at 269 Queen St, Port Perry. 905-985-4971 or obtain information on the Internet at www.scugogchamber.ca for further details regarding upcoming events.